Recently I was asked by a winter camping enthusiast, who otherwise enjoys fine dining: How do I prepare good food that can be enjoyed while winter camping? I'm a small town guy that now lives in the city and I"m happy to share my experiences. I've learned of many opportunities in the city but have grown to appreciate the intangible things of the small town living I left behind. I certainly appreciate it more when I visit up north today. 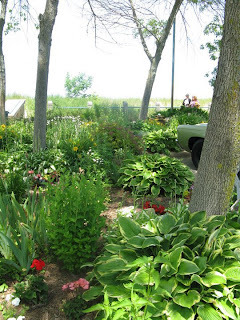 I grew up in Owen Sound, Collingwood and my home town of Orillia. All are located in the province of Ontario and at the southern tip of beautiful Georgian Bay. I'm no stranger to the great outdoors and roughing our Canadian four seasons. Iron and fire have been around for centuries and almost anything can be prepared when armed. Why, some of the best snails I've ever enjoyed were prepared over a campfire! I spent 4yrs in Collingwood, ON when I was in elementary school. 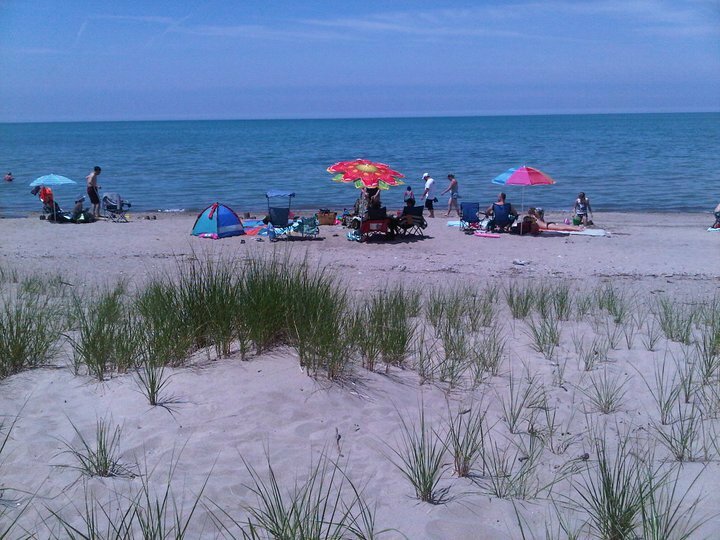 It's a small little town centered between gorgeous Wasega Beach and popular all season retreat, Blue Mountain. Some of my favorite memories are of wilderness there and everything imaginable outdoors. Our home was located rurally just off HWY #26. I can remember waking on cool summer mornings to see people snail hunting in droves. All the way down our long gravel road you'd see people lugging their pails. Big white pails of garden snails they collected from the dewy roadside rough. All were in their rubber boots and wore back supporting belts. It was a peculiar sight for kid barely awake. I used to think they were all crazy! Now it's just a fond memory of something I was lucky enough to witness. It's a memory that can be appreciated of an ingredient that has inspired so many wonderful recipes. I'm not suggesting you shine up your rubber duckies and start combing the roadside trenches. Snails are far more easy to buy canned in water at the grocery store. Although it might be a fun outing for friends and family, collecting snails is something that wouldn't be possible in relation to winter camping. Even if you were summer camping you'd hardly have time to prepare. Many of the toxins snails consume can be harmful for human ingestion. Snails have to be purged to safely avoid serious illness. A diet of lettuce leaves in a controlled environment, it's a process that takes at least four weeks. You'd have to be the ultimate master of preparedness to properly ready your collection. When I think of winter camping and the crisp northern air, I think about being huddled over a camp fire and absorbing the well needed heat. 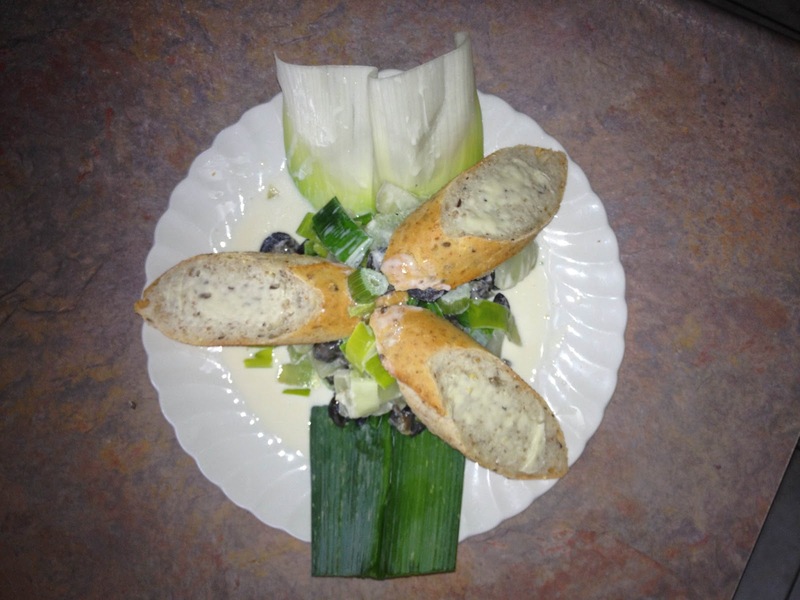 The best escargot in the winter fresh air is a sweet and creamy treat. Something that will warm your belly and compliment a strong cup of black coffee. Sambuca cream campfire snails will be enjoyed by all that love good food. 2 cans snails, in water. 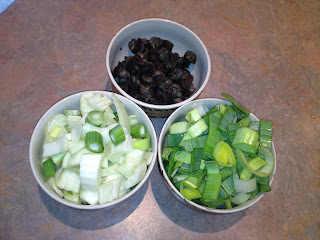 2 heaping cups fennel, cut into bite size chunks. 250 ml of 18% cream. You won't be out in the winter cold too long without an active campfire. Use rocks to build a platform that will hold a BBQ grill. Get the fire nice and hot to create a bed of red hot coals. You have and iron pan and your ready for action. 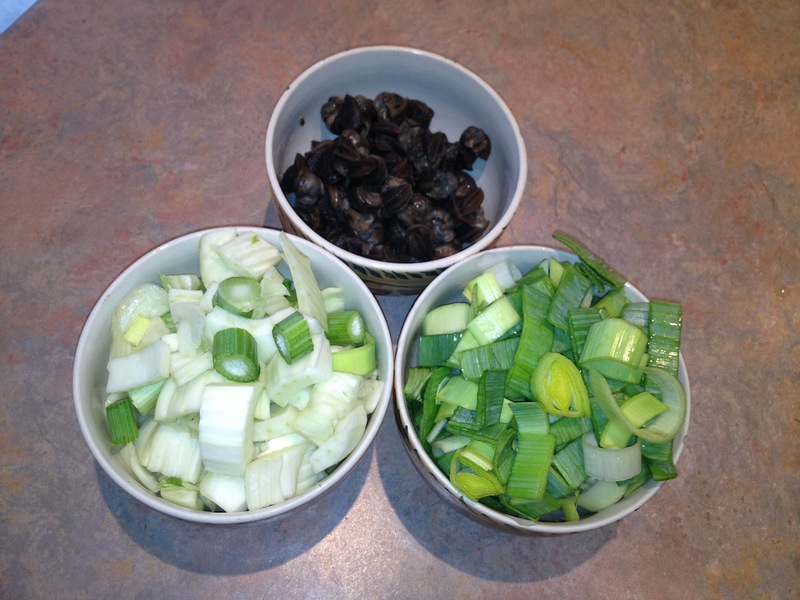 Drain and rinse the snails and add them to a hot iron pan with butter. Start a nice sizzle. Add fennel and leeks to the pan with a pinch of salt and pepper. Give it a nice stir until the leeks are bright green, still crisp. Add the Sambucca and burn off the alcohol. There will be a little storm before the calm. Add the cream and stir it in. Let it bubble for 2mins. This is a very easy recipe that tastes so amazing. Toast a baguette with butter and sop up this delicious sauce. It's enough to properly serve four. It's like having desert for appetizer. This also works fantastically with mussels! My mother is Canadian of English background, my father was Greek. That makes me one of the most well spoken and irrational characters going. I was influenced my both sides of the family as far as cuisine is concerned but one thing we could always agree on is our love for good Greek food. Who in the world doesn't enjoy Greek food? We all have our favorite Greek dish and everyone has their favorite Greek restaurant. I left my favorite Greek restaurant behind when I moved to Toronto 7 years ago. It was a time to make new friends and explore new opportunities but someone had to get me to the Greek already! Not long after I moved to Toronto, I was introduced to Astoria Shish kebob House in Mississauga, ON. A friend of mine suggested we go for lunch. What a terrific discovery it was! It was the perfect place for a lazy lunch and has become one of my favorite places to eat. It's quite nice inside and hardly formal. Bistro style dinning it's best. The first thing I noticed was it's cleanliness and ding room's airy design. It leaves you feeling like you can dine with space and features a stone fire place at center. It's a Mediterranean atmosphere without all the usual gimmicks that come with selling Greek cuisine. There's no dancing, no plate smashing and thankfully no naked statue of Apollo with his OPA out! They have a modest wine list, bottled beer and a standard bar rail to offer. That and their open concept grill would suggest the emphasis is all on food. 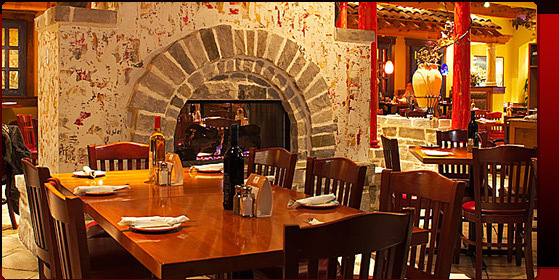 Watch their grill master prepare all the Greek specialties or just enjoy the wafting aromas from your table. Their lamb souvlaki is a robust skewer prepared to a temperature you'd enjoy. It's served with some of the best tzatziki ever made. I have yet to find something it doesn't taste amazing with. The menu at Astoria has all that you'd expect of good Mediterranean cuisine. Astoria offers a small patio that can be enjoyed all summer long. 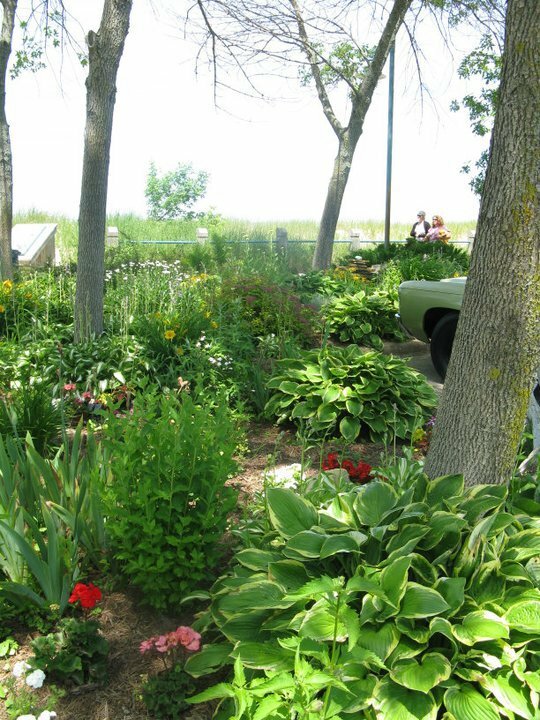 Located on a busy stretch on Dundas St. the patio is set well enough off of the road that it can be enjoyed without the dust traffic can kick up. I've popped in many times for just a cold Stella Artios and a flaming saganaki. on a hot summer day. A cold beer and that salty kefalograviera is often more enticing than the rest of the days responsibilities. Last June my uncle George past away at the age of 92. One of the last of his generation, God rest his soul. Many arrangements had to be made and we all did our part as a family. For me, Astoria was an easy choice made for a group of 32 friends and family. The solarium couldn't have been more appropriate to celebrate a good man's legacy. It was a sun filled room on a beautiful summer day, symbolic of his eternal memory. Agiorgitiko complimented with feta cheese was a wine selection that everyone enjoyed. Hummus, olives and pita for all! Greek village salad and grilled Chilean Sea Bass was served. It was everything we could have possibly enjoyed. The children devoured all of their souvlaki. and were mystified by the flaming saganaki. The service was attentive; it always is, our waiter worked a relaxed pace. Astoria couldn't have offered us a better experience. See you again soon. If you're passionate about anything at all, you hope to inspire those most dear. Remove all ignorance and be known. 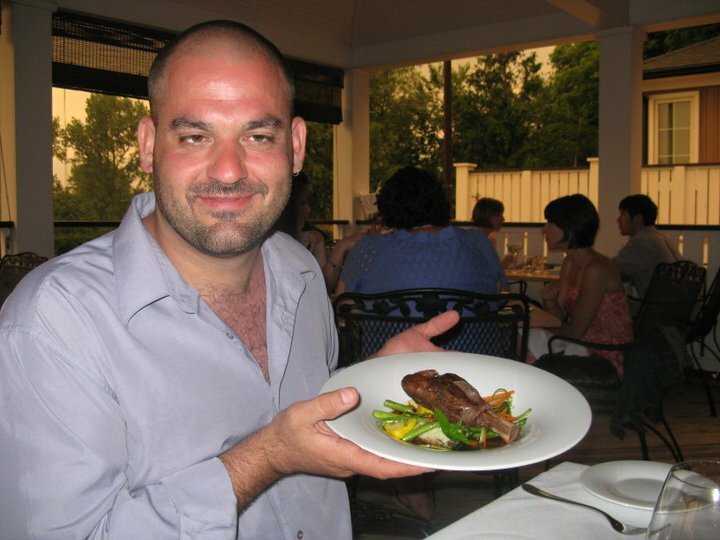 There's no denying my passion for food and service so long as I can remember. Some of my fondest memories are of fishing with my grandfather. I'd hover over his shoulder as he filleted our catch. I peeled vegetables with my grandmother and baked bread with my mother. Everything we made was from scratch. My grandmother schooled me on which silver to use and my mother on my manner. My grandfather provided all the charade, our dining room the fanciest of restaurants. He'd inspect my glass against the light then pour a third of a glass. He'd snap my napkin over my lap, and confirm his perfect pour, "2% sir?" I often wonder who I'd be if it wasn't for the time we shared? For the time it took to prepare good food was the time we knew each other. It hardly takes a keen eye to know that times have changed. I can stand in a checkout at the grocery store and be horrified by what I see. Chicken nuggets, hot dogs, frozen pizza, ready made sauces, powdered juice, canned pasta, processed meat and more. I wonder where all the ingredients have gone? Hot dogs alone are a multi-billion dollar industry in North America and if you're from the U.S.A, you celebrate, "National Hot Dog Month". Every July is a special time to honor it's contents of mechanically separated chicken, pork and beef. It's a delicious batter of meat, skin and bone laced with massive amounts of salt. Thickening agents are used to bind its contents that are also known to include snouts, ears, organs, vegetarian meat substitutes and preservatives. The only people that should celebrating "Hot Dog Month", are the people that sell them! I'm hesitant to think it was God's intentions when he appointed Noah to build an ark. Preserve all species two by two, so they may walk the earth once more. Depicted by artists, Jesus stands over the 12 apostles and God's bounty of fresh ingredients. "The Last Supper", as it were. A feast! A blessing of nourishing food. Blasphemous it would be if it were written of 5000, that Jesus fed them til their bellies were full, but only 2 chicken nuggets and 5 pizza pockets. I count my blessings today for the many chefs and food lovers that protect the integrity of food. I'm hopeful when I see food forums and food communities that have so many recipes to teach. They're full of passionate people that post their beautiful images. It's easy to feel inspired when so many learn from each other. So many families will benefit from their passion about good food. Jamie Oliver on taking processed food away from our children. -"It's like taking away a pair of David Beckham Adidas football boots and giving them a pair of Jesus sandals." Nothing could be closer to the truth. 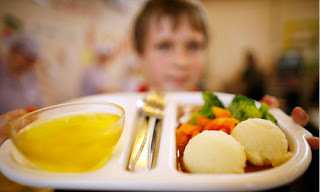 If you've never heard of Jamie Oliver's Food Revolution, I strongly urge you to watch his documentary called Jamie's School Dinners. It chronicles his plight to ban processed food from London schools. It's a shocking series that follows a celebrity chef's efforts as he moves to convert children's eating habits, gain the confidence of school boards, increase funding from government and keep the support of parents. Only to mention a handful of ways that our children won't live with dignity. There's crucial few years that young bodies and minds will have to develop and grow. It's the only chance we have to influence their standard of life. Entire Nations suffer from famine and disease. A starving child will never have a choice to eat with integrity or not. It's horrifying to think it's appropriate, the gut wrenching image it is. A child deserves the necessities of life. A child deserves good food. I certainly don't live perfectly. Not by any means a medical authority. I'm just a cook that knows good food that's made with real ingredients. 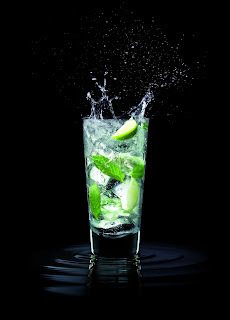 The Bacardi Mojito: Why can't I get one? As professional servers, we have a well developed instinct for the guests we host. We've done this for years and we're good! We can greet a first time guest at the door, hang their jacket, show them to their reserved table and already we have an accurate vibe for their quirky nature. Call it what ever you will, it just comes with experience. Clientele are quirky indeed (we all are) and they all have their own vision of what their experience should be. There's nothing more satisfying than a satisfied guest. Of course! This is our livelihood and the lifeblood of the establishments we work. However, we're wise enough to know there's countless ways a dining experience can go sideways. Weather it's a rocky dining room table, loud neighbors or a less then polished place setting, the possibilities are endless multiplied by pi! No matter how great the challenge, it's swift recognition that puts a guest at ease and defines your establishment's standard. That's what professionals do. I certainly don't mind working my way back into the good graces of a disappointed guest. When addressed appropriately, it's often more lucrative than what a smooth service might have been. One of the golden pathways into the abyss of tables gone sideways is also one of my biggest pet peeves! In all my years of food and service nothing has had me stumped like The Bacardi Mojito. Once little known, there isn't a single living being in North America that doesn't know what a Bacardi Mojito is. The commercial is outstanding and leaves you disappointed that it's only made for a 30 second time slot. Hell! I have two left feet and this commercial made me want to shake my money maker! What a trendy ad! Have a look to refresh your memory. Visit the website for the full version of that booty shakin' music while you learn Bacardi's Mojito recipe! Server: I'm sorry we don't have fresh mint leaves. Guest: Why don't you have fresh mint leaves? Guest: I really wanted a Mojito. Guest: Isn't there something else you can use? Server: It can be prepared with creme de menthe. Guest: I don't want creme de menthe. Isn't there a fresh herb you can use? Server: We have no other fresh herb that shares the same characteristics of mint leaves. Guest: What about basil leaves? Server: I don't believe a Mojito cocktail would be best enjoyed with basil leaves. Guest: Do you like Mojito's. Server: Quite nice with fresh mint leaves. 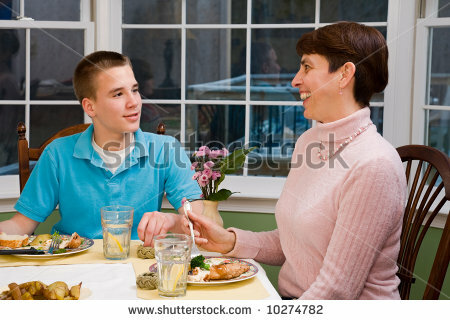 Guest: Why don't you tell the restaurant owner to order mint leaves? Server: I'd be happy to bring it to his attention. Guest: Good because next time I come here, I hope there's mint leaves. Server: I hope so too. Guest: Are you sure it can't be made with basil leaves? Server: I wouldn't suggest you have a Mojito prepared with basil leaves. Guest: Make one with basil leaves and I'll be the judge. Server: Isn't there another cocktail that you normally enjoy? Guest: I want a Mojito. Throughout service the basil Mojito remains untouched. It won't be enjoyed for its contents. Moving forward it's towering monument, lest you forget the competence gunned down in it's place. I consider myself a very articulate and professional server. I pride myself in my organizational skill and table side tact but there's something about "The Mojito Interrogation" that has me on my heals every time. My fear is to appear condescending in the wake of ignorance. It's for lack of a short and satisfying explanation that I can be found table side, swaying like a post in the wind. Your guest doesn't care why you don't have fresh mint. They're annoyed. You're a restaurant for crying out loud! What's the problem? You're supposed to have it! They only want a Mojito. So why can't they get one? Despite what people think, a restaurant isn't an emporium of endless ingredients, herbs and spices. It's not a grocery store of magnificent proportions with thousands of costumers per day. More true, a restaurant has a menu that's a well thought out plan inspired by ingredients with several uses. Designed for profit without waste it allows a restaurant to offer its guest the best possible freshness at value. As you can see, all these inspired offerings contain ingredients with multiple uses. Designed for profit without waste it allows a restaurant to offer its guest the best possible freshness at value. Of course almost any restaurant offers fresh daily features but they too have to be integrated by careful design. I'm sure there's more but in order to integrate mint as a viable inspiration, it has to have enough uses by design for profit without waste and offer its guest the best possible freshness at value. If you were to offer fresh mint as a cocktail garnish, you'd have to order it every other day. If you pushed your servers hard enough, you might sell five Mojito's in that span and a couple of After Eight Martini's. You could enjoy 200 covers on a Saturday night and only sell 40 desserts as people share two, three, four ways or won't have dessert at all. Maybe only a handful of those desserts are appropriately garnished with fresh mint, chocolate mint sauce or a fruity mint coulis. That leaves a whole lot of product to make mint jelly. You can garnish a rack of lamb with mint jelly but on a Saturday night of 200 covers you might only sell 20 of those. Considering weekday business is far more modest than an off-the-hook-Saturday-night, maybe mint in its freshest form, doesn't have a place on a menu at all!. I know it sounds harsh. It breaks my heart to say it. In most restaurants, fresh mint doesn't place in the grand scheme of profit, waste, freshness and value. However, if you planned a large party in advance and wanted to offer your guests a Mojito Punch made with fresh mint leaves, there's no restaurant in the world that would deny you. By the power vested in me; I Chris Boukouris hereby, banish The Bacardi Mojito to the back yard BBQ's of North America, to be enjoyed by all of legal drinking age for its citrusy contents and soda. Not excluding Bacardi white rum and fresh mint. I don't have anything against a Bacardi Mojito. They're quite nice actually. My concern lies with the relentless interrogation that follows a Mojito or nothing mentality. You'd be hard pressed to develop a short form explanation that doesn't sound condescending. One that would stop a fresh breathing Mojito dragon in their tracks. If you do have one..........this waiter's all ears. Now, will you enjoy a cocktail right away? If you've ever encountered a monkfish and a lobster in a bar, I'm certain the monkfish was the ugly sister! There's no understating how truly unattractive this fish is! Okay, an unlikely encounter. 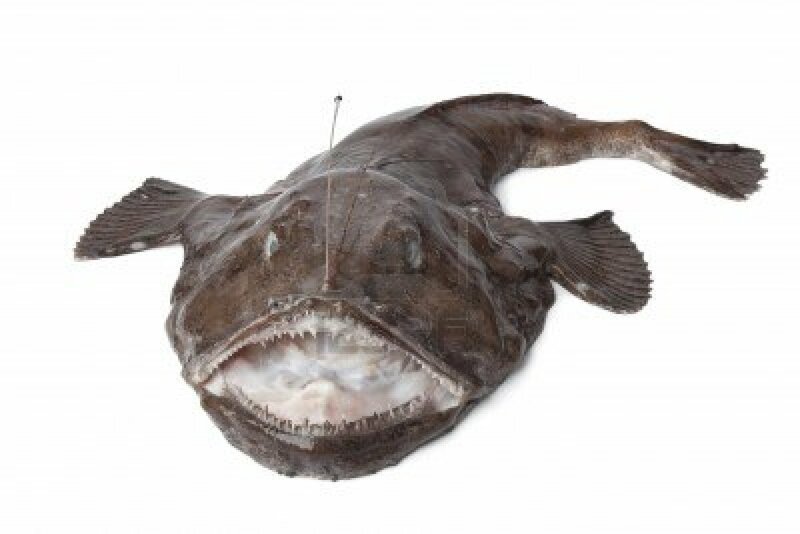 More likely you'd encounter a monkfish in the North Atlantic, primarily from North Carolina to the Grand Banks of Newfoundland. They're harvested fresh for their tails September through April and available frozen all year round. These seabed predators are called monkfish or sea monks for their cloaking ability or ability to camouflage themselves and ambush prey. In old time Norwegian lore, it was believed that a giant monkfish lurked the Norwegian sea and was often depicted by artists as a steely toothed monster with mouth agape. Many trawlers and scallop draggers once considered them useless bycatch before they gained popularity among Scandinavian and European families as an affordable alternative to the much more expensive lobster. Despite its regrettable exterior appearance, their tails have a subtle sweet taste and a density similar to the meat of a lobster or scallop. At temperature the meat is white and can be enjoyed with almost any sauce. It can be used as an alternative in almost any imaginable lobster recipe. It's for the similarities the monkfish and lobster share that it gains its alias, "poor man's lobster." I've had every opportunity to dance with the poor man's lobster and have truly enjoyed the commonality. Like many other seafood ingredients, monkfish has an unforgiving temperature window and must be prepared attentively to truly enjoy its fluffy and dense character. From brothy fish soup recipes to diverse pasta creations from Surf and Turf combinations to saucy staring roles, this lobster like ingredient will intrigue your dinner party guests and spark the dinner table conversation. It's funny that I have always thought no one ever looked down at a finished plate or ingredient and said, "That looks like crap! I betcha it tastes delicious!" My theory is proven wrong because someone, somewhere and well before my humble existence, netted a monster of the sea that looked like crap but tasted delicious! Perform a monster makeover of your own and transform a monster of the sea into a gorgeous bacon wrapped medallion and your guests into steely toothed monsters with mouths agape! Boil the new potatoes whole, skins on. Add the green bean shards 3min before the potatoes will be ready. The potatoes should be cooked but firm and beans still crisp. Strain and rinse with warm water. Leave it aside. Lay the monkfish fillets on a board and sprinkle with thyme leaves. Make sure the fillets are dry. Lay the fillets on top of one another with a tapered end a wide end on each side. Wrap with bacon strips firmly around the fillets with all loose bacon ends on the bottom. 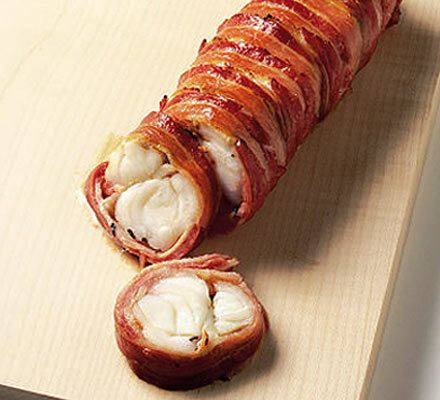 On a preheated skillet lined with parchment place the wrapped monkfish roll with bacon ends on the bottom for 8 min or until the bacon crisps. Roll with tongs another 8 min until the bacon is crisp all round. When the fish is firm to touch remove skillet from heat and leave to rest covered. Mix the crushed garlic, Dijon mustard, red wine vinegar and olive oil for a vinaigrette. Toss the warm potatoes and beans in the vinaigrette. Divide on to four plates. Scatter fresh watercress on top of each. Slice and place a 2cm thick monkfish medallion on top. Drizzle your dishes with all juices from the monkfish skillet. Also nice when garnished with oven roasted cherry tomatoes! Sriracha Thai Chili Sauce: By Huy Fong Foods Inc.
September 1994, the Buffalo Bills were in the first month of the season. Fresh off their 4th consecutive Super Bowl loss and the second in a row to the Dallas Cowboys. It's a record that will never be broken. I had managed three tickets from the Buffalo Bills box office for a sunny Sunday afternoon tilt with the Indianapolis Colts. Now you can't make the trip from Orillia, ON to Orchard Park, NY with out taking in everything Niagara Falls has to offer. Weekend planned! Our trio booked a hotel and departed on the Friday evening. We made a timely check in and awoke to some immaculate September weather! In our t-shirts, we did all the Niagara things. Took pictures of the falls, visited the wax museum, rode the tram, checked out different restaurants and of course you have to swirl around at the bottom of the falls aboard the legendary vessel, The Maid of the Mist! Sunday morning was game day and we were up and at it. No time to waste! We were traveling with a female among us so of course we had to be up way too early, wolf down a continental breakfast, cross the border, and first stop in Buffalo to wander the dreaded..........MALL! Farewell tailgate party, so long convenient parking spot and hello shoes she'll never ever wear. I played along, I went, I dragged my feet like a sloth. Then I saw it. The most enormous island kiosk smack dab in the middle of the mall hallway. It was a hot sauce kiosk. I mean an enormous hot sauce kiosk! There must have been 500 to choose from! Anyone who knows me would tell you that I have a fever for the sinus enhancing fruit. I'm pepper crazy! In all its varieties; Scotch bonnet, jalapeno, habenero, sweet, pickled, fat, slim, tall, short, red, yellow or green, peppers are my bag. I didn't know where to start. The Gappetto like character manning the kiosk sent me on my merry way with 12 different pepper varieties and a complimentary bottle to make the bakers dozen. 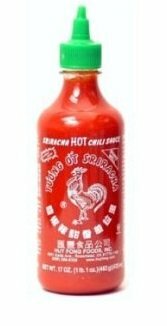 Sriracha Thai Chili Sauce by Huy Fong Foods Inc. It was a nice haul, that grab bag of hot sauce from the U.S. of A. I enjoyed almost all of them for their distinct characteristics and ingredients. As much as I like heat, I won't compromise flavor for a Guinness World Record for Scoville heat units, diluted ingredients or heavy vinegar based product. Sriracha Thai Chili Sauce is the perfect balance of flavor and heat. Made with sun ripened chili's and garlic, it's a ground paste that contains no artificial colours or flavors. Packaged in a convenient squeeze bottle, this wonderful bright red sauce is stamped with a distinctive rooster logo. I have found many uses for sriracha besides the traditional hot sauce delegations. It's a legit and versatile ingredient in my book. That's what's most notable for me. That's what puts Siracha Thai Chili Sauce on my top shelf. When my most prized bottle of all hot sauce bottles gasped it's last breath over a cauldron of home made chunky salsa, I visited almost every grocery store in Orillia. I called the ones I didn't by phone. Nobody I spoke with was familiar with the product. After inquiring with a number of whole sale food providers to no avail, I resorted to my 1994 dial up internet. No results for sriracha. I searched Huy Fong Foods Inc. and found a company in Los Angeles, California. I phoned to make my inquiries only to learn that they were a small, modest company that didn't sell their product in Canada. They agreed to ship me their product if I ordered at least a case. I did just that. It took me nearly 18 months to deplete my supply of beloved rooster sauce. By then Huy Fong Foods Inc. was distributing in Canada. Today they're among industry leaders and their product can be found in almost all Canadian grocery stores. The rooster will always have its place in my refrigerator door. I have since seen Sriracha Thai Chili Sauce used as an ingredient on Top Chef, Hell's Kitchen and even Iron Chef! Chefs don't use condiments in their dishes! That makes me particularly proud of my chance discovery and pursuit in 1994. All and all it was memorable road trip with friends. We took in the Niagara attractions, witnessed a 10-6 Buffalo Bills drubbing from the highest of nose bleed sections. We met Dave Andreychuk, who had just enjoyed a couple of exciting playoff runs with the Toronto Maple Leafs. We paid a homeowner $30 to park on her lawn with 60 other vehicles that didn't get early bird parking spaces. We raced a kilometer to Rich Stadium and found our seats just in time to be a part of the opening kick off cheer. Good times! All that aside, the highlight for me has to be that stop in Buffalo to wander that dreaded..........MALL and that wonderful island kiosk of spicy variety. There isn't much time for recreation in my business.Those of you that work in the industry would surely attest. Long hours, double shifts, split shifts, on call and weekends. It's not an easy business and if you're like me, you feel like a vampire living opposite ends of the day from all those 9 to 5 weekend offer's.What can I say? We're dedicated, passionate workaholics. As unpredictable and erratic as our schedules get, it's important to enjoy a little break in the action and take advantage of those off season lulls and lazy weekdays. I have a favorite little spot that I like to go, even if it's for a little two day getaway. I've been going there once every summer for 15 years and It's well worth the 2 1/2 hour drive from Toronto. 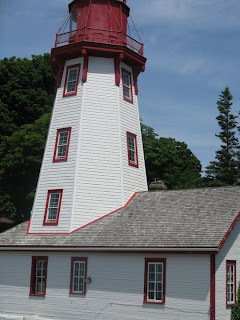 It's a quaint little British influenced town on Lake Huron called Kincardine. Kincardine is a beautiful little beach town famous for their sunsets. 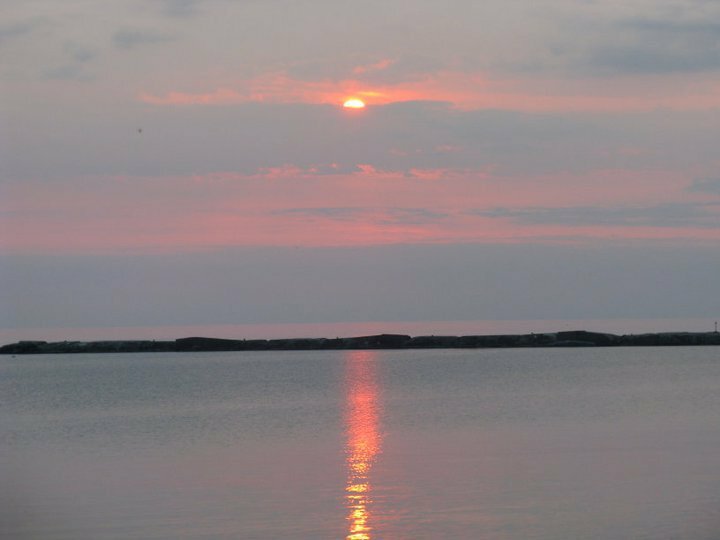 Every hot summer night; locals and tourists alike, can be found parading their blankets and lawn chairs through the town streets, gathering to watch the sunset over Lake Huron. 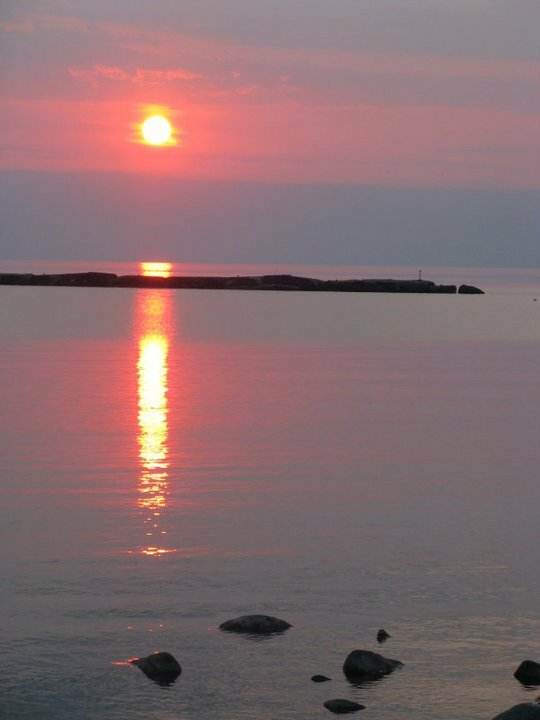 If you're lucky enough to be there on a Saturday night, the Phantom Piper will play his bagpipes atop the marina lighthouse as the sky lights its wondrous hue to end another summer date. I could go on and on about this special town and it's special place in my heart but I must get to my point of discussion. The Harbour Street Brasserie. The Harbour Street Brasserie is easily a highlight for me anytime I have visited Kincardine. With it's upper casual to formal dining atmosphere it's made comfortable with it's Colonial, cottage like ambiance and professional service. A solid, simple menu keeps ingredients fresh and is complimented by fresh daily dinner features that will have you torn between ordering one of everything or booking a second dinner reservation. A must every time I go! Last time I visited with a lady friend and entertained another couple from Toronto. 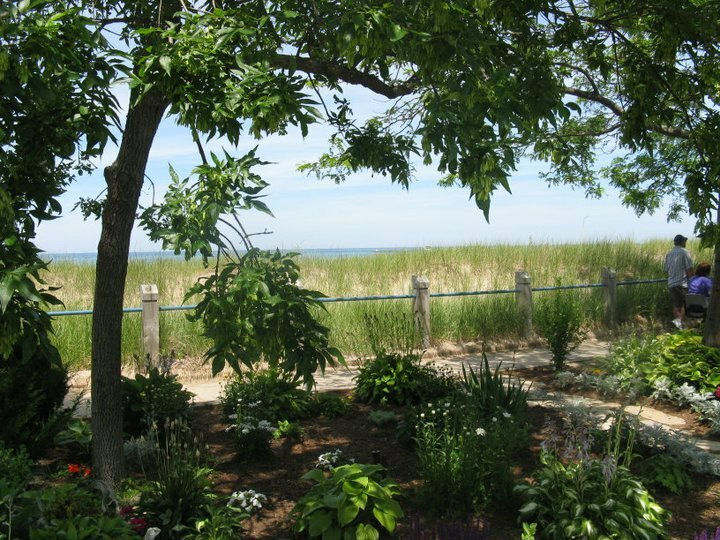 We dined on the patio over looking the tennis courts and Lake Huron. The patio is hard covered in gazebo like fashion and the light glowed as the sun neared the water. We had some laughs and good conversation while the violinist played a birds song behind our white linen table. Presented with care and fresh ingredients, I enjoyed the escargot for appetizer, braised lamb shank for entree and creme brule for dessert. What a great night, great food and great wine selections. My guests returned to Kincardine 5 weekends straight! Feel free to disagree, concur, share and converse on my blog. Lets enjoy where ever the discussion spins. Lets get down to the good, the bad and the ugly of everything I'm inspired by.